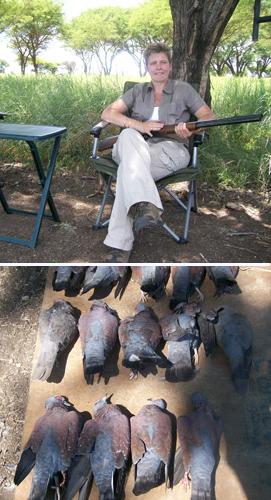 South Africa is all the worlds-in-one and therefore also offers like the game species some of the greatest variety of game birds found anywhere. We also have a number of Pigeon and Doves and can be found flying in flocks numbering in their thousands at certain times of the year and are not unusual for the hunters of these worthy advisories finding it difficult to stop sharing their days successes with fellow hunters. All game birds hunted are given to the local workers as valuable protein as part of sustainable utilization of our wildlife resources. Typical hunting trips for game birds include group sizes of 6-10 hunters for 7 days which also afford the hunters to fit in a day for hunting game if so wish.